Desiree at play! : Spring is near! I love these delicate little flowers! This set is Sweet Stems. The colors I chose for this card are Certainly Celery, Whisper White, Pink Pirouette, and Almost Amethyst (which I haven't used in ages). After I stamped the flowers in Basic Black I colored them with chalks and then used markers for the small dots. I really like the soft look. 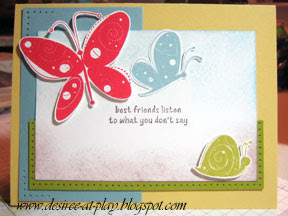 I used the Swiss Dots embossing folder with my Big Shot for the Whisper White layer. I added Certainly Celery twill ribbon (fron Sale-a-Bration), a silver hodgepodge ribbon slide, a silver mini library clip and a pink rhinestone brad. The sentiment is from the set All Holidays. I used Mojo Monday 73 sketch for this one. 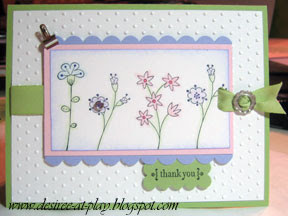 A pretty little spring card! And to all my friends and family, I did not make any Valentine's cards, not one. Such a shame really. So don't be looking in your mailbox. I still have a Christmas gift to finish up. Am I a procrastinator or what??? Thanks for stopping by and have a great day! 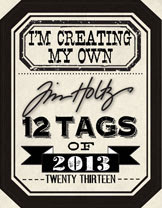 Go be creative!